All of the following pieces are written for the Logos robot orchestra. 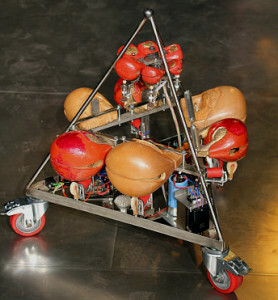 Various studies created in collaboration with dancer Emilie de Vlam, where the robots interact wiht the dance movement, using Godfried-Willem Raes’ Namuda system. A quartet for four of the smallest robots of the orchestra. For bass flute and interactive robot orchestra. PRemiered by Karin Defleyt. A hyperpolyrithmic piece for <Temblo>, a robot with 12 temple blocks. A piece for robot ensemble, based on a microtonal 12 tone series. This pieces are part of a series of studies where i explore the possibilities of the robots of the M&M orchestra that distinguish them from human musicians. In ‘Study #12, for robotic wind septet’, i explored the idea of using a continuous, non-quantized pitch- and time space, using the ability of the robots to play very precise glissandos, slowly drifting from chord to chord. Study #13 is developping further on this idea, exploring the auditory effects of slowly shifting microtonal intervals. An algorithmic piece based on the boids algorithm. A picture of the robot orchestra converted to music played by the robots. An interactive piece for dancer and robots, premiered by Zam Ebalé, using the Namuda technology developped by Godfried-Willem Raes. A piece for the <hat> robot, that was ordered by Aphex Twin from the Logos Foundation. Before we sold the robot, luckily me and my colleagues had the chance to write a piece for it. “After bpNichol” is a composition for audio track and the robotic instruments of the Logos Robot Orchestra. The audio track is a montage of samples of bpNichol‘s voice, mostly with no or little processing. The Logos Robot Orchestra is an orchestra consisting of over 40 robotic musical instruments, some of which are automated existing instruments,others are completely new inventions. A lot of this instruments have very fine expressive control, which I use in this composition, to imitate, extend and complement the voice sounds on the tape. An interactive piece where the robots respond to the movements of a dancer. An algorithmic composition for the robot orchestra, based on the a083522 integer number sequence. A study investigating the possibilieties of the <Krum> organ module. A piece for the automated quartertone organ <Qt>, commisioned by premiered at the Gent Conservatory. The piece starts off with an exploration of the immense harmonic possibilities of the quartertone scale, following a stepwise motion algorithm that tries to make natural sounding transitions between the quartertone chords that otherwise might sound alienating to the listeren. Next, departing from a tremolo in <Qt>’s highest register, ever permuting melodic patterns are built up, gradually covering the whole range of the instrument. In the mean time a two voice bass part develops following a random walk alorithm. This bass part later on forms the foundation of augmented and diminuted spectral chords that interrupt the melodic patterns. Departing from this patterns, a counterpointic texture of accelerating rhythmic patterns is built up. The piece ends in a Nancarowian climax with several scales and motivs crossing each other at different tempi. The title of this piece is a permutation of ‘Cogluotobusisletmesi’, the title of the famous quarter tone piano piece by Clarence Barlow. Another interactive piece where the robots respond to the movements of a dancer. Interactive piece for dancer and robots. Interactive piece where the robots respond to the movements of a dancer. In this piece a performer (Moniek Darge) engages in a dialogue with the robots of the <M&M> orchestra. The robots are controlled by a computer program written in GMT that interacts with her movement and with the sounds of her e-violin. The robots behave as real musicians, with each their own character and their own response on the input of the performer. This piece uses the invisible instrument, a sonar motion tracking system designed and built by Godfried-Willem Raes and the CQT2 polyphonic pitch to midi convertor created by Johannes Taelman. This is a collective composition in several episodes by Moniek Darge (e-violin) and Kristof Lauwers (computer programming). The electric violin engages in a dialog with the automats of the <M&M> (man and machine) robot orchestra, whereby each automat behaves as a fully fledged musician. It is an interactive work in which the boundaries between composition and the development of musical instruments and interfaces fade. Plastic Deformations is an algorithmic piece for the <M&M> music robots, based on a cellular automaton: a virtual space is divided in some 500 cells. Some of those are inhabited, others are empty. The algorithm creates several generations of cells, whereby the content of each cell is derived from the content of the neighbouring cells in the former generation, through a fixed formula. 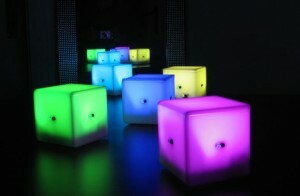 This results in complex, everchanging patterns, which where translated into pitches and rhythms played by the robots. The program that plays back the piece allows some user interaction: the instrumentation can be controlled in real time, and various filters can be applied to determine how the data from the cellular automaton are translated to music. This piece is written for the automated saxophone <autosax>. 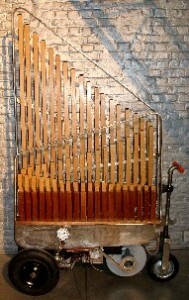 The sound of this instrument is (partially) generated by a computer controlled acoustic feedback mechanism. In this piece i dropped the computer control, and explored all feedback sounds that spontaneously occured while playing all kind of patterns on the valves of the instrument. I scored this piece for an automatic barrelorgan, a playerpiano and percussion automats, all part of Godfried-Willem Raes’ automaton orchestra. The organ part consists of four voices that move within a predefined, evolving range, driven by a Markov chain based structure (that’s where the random numbers come into play). Four piano voices are continuously recycling the note material of the organs, dynamically and rithmically accentuating certain events in the flow of the primary algorithms. The percussion provides rhythmical continuity, but never exact periodicity, indicating all moments where the other instruments might or might not play a new note. The doming structure is very simple and slowly evolving, so that an almost meditative atmosphere is created and the listeners focus shifts to a smaller time-scale. It is impossible to detect the precise working of the algorithms by ear, but the melodic and counterpoinctal structures heared by the attentive listener are closely related to the inner workings of the computer program. During performance of the piece, instrumentation can be controlled dynamically and certain events can be triggered in real time from the computer keyboard. This composition is written for the occasion of the 50th birthday of of the composer/ performer/ instrumentmaker/ … Godfried-Willem Raes. It is scored for two instruments of the automaton orchestra he is currently creating: <Vibi>, an automated vibraphone and <Harma>, a harmonium. The piece uses the renaissance cantus firmus technique, where one melody, borrowed from a song or constructed from arbitrary rules is used as a base around wich a polyphonic piece is built up. Here we used two melodies. The first is the song Happy Birthday, the second is based on the letters of the name Godfried-Willem Raes. Both melodies are stretched in time and played simultaneously, so that they can’t be recognized anymore. The other voices are built up of the sum – and difference tones between this two voices.